Amazingly, it hadn’t even started yet when I thought this. In the first 2.5 hours since I arrived in Toronto, I’d had the social media time of my life. 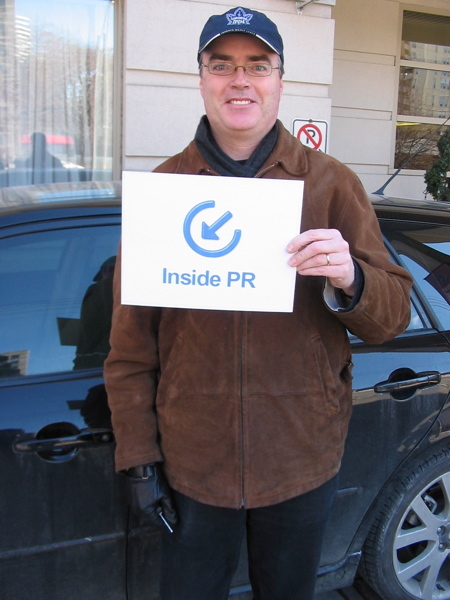 Got picked up by Terry Fallis, from the excellent PR and agency-side Inside PR podcast and Thornley Fallis, at the airport. We drove straight away to the Imperial PUBlic Library to meet up with some folks. This is the sign he held up when I walked out of customs. Holy cow, the pub was like the pantheon of social media superstars in Canada and the American NE. I was stunned, humbled, and awed. I can’t tell you awesome it was to talk shop with people I felt like I have known for years. Key players were Mitch Joel, host of Six Pixels of Separation The Twist Image Podcast and John Wall, host of The M Show and his wife the lovely Corinne Carin (my apologies), Leesa Barnes, Mitch Joel from Six Pixels of Separation – The Twist Image Podcast, Michael Seaton – Scotiabank’s The Money Clip Podcast and The Client Side, and Bryan Person from New Comm Road. Today I’ll be meeting Donna Papacosta – Trafcom News when I finally meander to Podcamp Toronto. More later. Great to hear it’s going so well Luke! I never doubted you’d have anything but a great time, the Canadian social media scene is thriving. Looking forward to reading your posts when you finish up! It was great speaking on the panel with you today. Although it was a breif time hanging out, it was very cool. I hope you enjoyed Toronto. Great, great times man. Sorry to have kept you up so late. Also, I did indeed steal 20$ from you. I don’t just intend to someday pay you back – I’ll paypal or email you the money. Funny story actually – I took out the 20$ for you this morning, got into a cab to meet up with Mitch, John Wall and Bryper for breakfast, and tried to pay with my credit card. Well, the cab driver’s credit card taker broke as he slid mine through, so I had no choice but to hand over your money. For all I know, my credit card was also charged the cab fare, but what concerns me most is having stolen your money. Sorry about that, man. At least you don’t have to worry about exchanging Canadian money back in the US. I’ll stop rambling now. Great to see you, Luke! People probably don’t know, but I my desire to visit the Toronto SM social media scene was ignited by my discussions with you after your trip north. I owe my decision to go to you. It was amazing. I look forward to finding the time to post more. I totally understand your time conflict. I really enjoyed your presentation today (thanks for the puck!) and look forward to delving deeper into The Client Side. Thanks for sharing your wisdom, see you in the ether. And your 20$ shall be proven well spent henceforth. I’d still like to ping it back to you, though. Hi Luke– It was truly thanks to you and Chris and Mitch and some others that this was a great event. Your participation, your energy, your thoughts and contributions made it an amazing experience. Well, it really was, Luke. And most of all, I’m pleased for *you* … you were able to escape the social media death valley of Iowa … I mean, Cleveland, for a couple of days to break bread and beer with some of the top minds in this space. I could not have asked for a better weekend. Thinking you’d say the same, Luke. No need to apologize, I’m the vindictive one, not Carin. Clarke: Good point, fixed that right away. I just got lazy and realized after the fact that my message may have been, um, misleading. Brogan: thanks man. Great to meet you, wish’d I have had more time to chat with you F2F. We’ll talk online for sure. Fallis: I like hockey, but there’s no WAY I’m as fanatical as you are. Folks, this guy REALLY knows his Leafs hockey. Holy cow!